Hoi Tod is a quintessential Thai "street food". 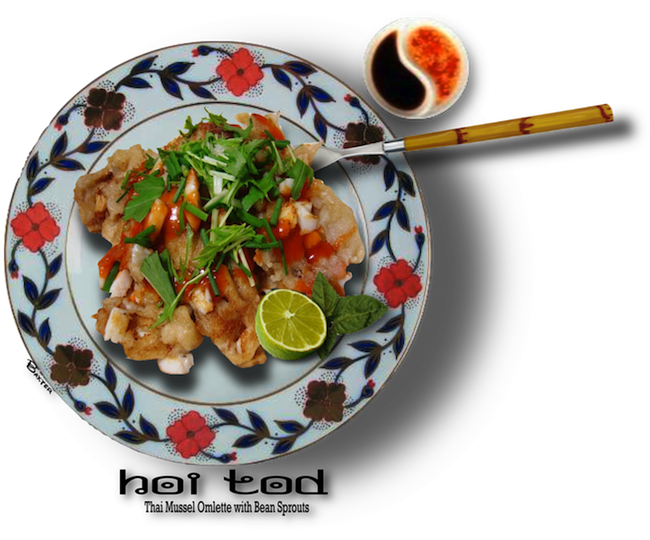 Special flat woks are made to cook this SouthEast Asian dish. You could liken it to a large omlette that is filled with veggies and mussels. Hoi Tod stands adorn many street corners in Bangkok. It is the "fast food" that satisfies the hunger for either breakfast or lunch. A tapioca flour pancake filled with mussels or any handy or available seafood such as shrimps, octopus, clams, or squid. Spring onions and fresh bean sprouts, spiced up with some sweet and hot chili sauce is the fast food snack of choice for busy city workers and executives alike. Most restaurants and street food stands feature this Thai favorite. pat dry, and finely slice. •	Clean greenshell mussels, remove shell, cut in halves and then set aside. •	Mix 3 flours together with cold water in a mixing bowl, stir well until flours dissolve. mussels in a mixing bowl, stir well. When oil is hot, pour the mixture into the fry pan. it over using two spatulas. •	Fry both sides until done and move to one side of the fry pan. and cilantro, then serve immediately with sweet chili sauce or Srirachi hot sauce. Use any shellfish,  octopus or squid in place of the mussels if you have it on hand.